FRP Advisory - Deploys cloud hosting for data storage - Exponential-e Ltd.
FRP Advisory deploys Cloud hosting for improved data storage. 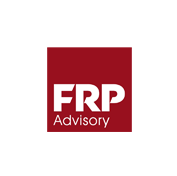 FRP Advisory is one of the largest independent restructuring, business recovery and insolvency firms in the UK, providing solutions to the business and financial community. FRP Advisory was formed following the management buy-out (MBO) of the Business Recovery Services (BRS) division of Vantis plc in June 2010. It now employs more than 200 staff, with 28 partners based at nine locations nationwide; in Bexleyheath, Birmingham, Bristol, Brentwood, Leicester, London, Manchester, St Albans and Worthing. For more info: www.frpadvisory.com. The MBO necessitated the need for the implementation of a bespoke IT infrastructure and operations system, with an immediate launch date. An evaluation was made of FRP Advisory’s requirements against those that BRS were using at Vantis, which also factored in the future capacity requirements for a fast growing business. Another challenge was the large volume of historical files and email data to migrate, and the little time for that data to be sorted. This was coupled with FSA regulatory requirements for data retention from old cases. Vantis BRS used its IT system for their communications and business operations on a large scale. The needs of FRP Advisory would reflect those of Vantis BRS, meaning that the IT infrastructure had to be reliable, resilient, fast and capable of handling vast volumes of data. Build an in-house server farm for FRP by reemploying legacy equipment from Vantis, supplemented by using capital investment to purchase new servers and data storage arrays that replicated the Vantis infrastructure. Create a bespoke virtualised environment using an existing service provider’s platform - one that had already benefited from a large amount of capital investment for highly resilient hosting servers and high performance Storage Area Network (SAN) data storage. FRP decided to pursue option B - the cloud hosting option - as it was the most advantageous from both a financial and resource perspective. Speed of deployment and migration. No additional IT staff to run FRP’s internal infrastructure. Cloud server infrastructure has native high availability and resilience 'out of the box'. Only pay for storage and resources used. Cloud gives native online backup that seamlessly integrates into FRP’s archiving and business continuity strategy. Private Cloud server farm gives high level of service, security and quality with the flexibility to scale up and down as demand desired. Costs can be controlled and reduced over time by monthly management of data and resources. In order to make the hosting environment viable and user friendly, a fast network was essential. Speed was of the essence as the MBO meant very tight deadlines for migration. “Following the tender process and due diligence, Exponential-e offered a platform that was technically and financially compelling and understood the need for a swift deployment. They were the only company that guaranteed to meet the deadlines and their technology was cutting-edge,” said FRP’s IT Director Mark Iwaszko. The first part of the Network rollout started with the locations being brought on-net to Exponential-e’s switched 10-Gigabit core next generation Network. Exponential-e was able to deliver a fast and resilient inter-office Data Network essential for the delivery of FRP’s IT systems. The Network offers fast communications and an infrastructure that seamlessly supports SIP and VoIP telephony as well as Data; dramatically and seamlessly reducing costs at the remote offices. The inclusion of disaster recovery failover circuits offers FRP an extremely high level of remote office uptime to ensure maximum business productivity. The multi-award winning company won the contract because it was able to offer a much higher performance Network – in most cases five times as fast (10Mb instead of 2Mb) for around 50 per cent of the costs from Vantis BRS. The new Wide Area Network (WAN) solution also included Disaster Recovery fail-over which Vantis BRS did not possess. Exponential-e provided virtual circuits over the access circuits required to establish full connectivity between all the locations for FRP. The Network solution – Virtual Private LAN Service (VPLS) - is a way to provide Ethernet based point-to-multipoint communication as a service delivered over an underlying IP/Multiprotocol Label Switching (MPLS) Network. VPLS is a switched service, much the same as a traditional LAN based switch performs its switching functions. All frames within a VPLS instance are switched based on the VPLS instances Forwarding Information Base (FIB). The FIB learns the MAC addresses of the connecting routers/hosts and can intelligently switch frames based on this information. Due to the presence of the underlying IP/MPLS Network, VPLS has significant advantages for both service providers and customers. Service providers can offer new Ethernet service with flexible bandwidth and sophisticated SLAs, while customers can connect all their sites to an Ethernet Virtual Private Network (VPN) that provides a secure and high speed Network. Another advantage of using VPLS as the technology for the data plane is that in case of failure, traffic will automatically be routed along available backup paths in the service provider’s core network. VPLS is a much more reliable solution for linking together Ethernet networks in different locations than simply connecting locations using traditional WAN links. All of the Vantis BRS servers, such as email, Blackberry, databases, IPS, PE and data files, were transferred to a set of virtual servers running on a private Cloud, hosted by Cloud Data in the London Docklands. There are two secure Internet break-outs from the FRP network providing load balancing and resilience. One is with Cloud Data in the Docklands and one at FRP’s head office in Furnival Street, City of London. Both are protected by firewalls that are managed by Cloud Data. Additionally, secure external remote access (VPN) into the FRP Network for authorised users is provided and managed from both of these points. The new IP Coretex VoIP PABX telephony system is primarily based at Cloud Data, with a secondary unit automatically mirroring the first, at Furnival Street, for automatic fail-over. The FRP Portal Intranet, Creditors Publishing Portal and Client Extranets are being hosted at Cloud Data on FRP’s private Cloud and published using Microsoft SharePoint Server Infrastructure. FRP Advisory had the advantage of starting with a new infrastructure, which meant it could leverage more recent technologies, as well as design resilience, into every part of its infrastructure for a low cost. Contract negotiations for the inter-office data network included backup fail-over lines for a competitive price. Using an on-demand based private Cloud Server infrastructure for FRP’s core business applications and servers, meant that a very high level of resilience was already built into the Cloud Server’s Docklands operations and no capital investment was required by FRP. The Cloud server’s inherent resilience means that every one of FRP’s Cloud servers are snapshot every five minutes during the day. Those snapshots are automatically moved to a separate physical location and are available to be restored within five minutes after a major event. This also means that FRP are able to virtually go back in time where we need to resolve problems or major deletions and corruptions of servers. The five minute images are stored for 24 hours and then three snapshots from the previous day are kept – 7am, noon and 7pm – for a week. Beyond that the snapshots are kept weekly and then monthly should FRP need to recover to a longer historical date. The snapshots of entire servers require an enormous amount of storage, which is included in FRP’s monthly hosting costs from its Cloud service provider. FRP Advisory had the advantage of starting from the ground up with a new infrastructure, which meant it could leverage more recent technologies, as well as design resilience, into every part of its infrastructure at a compelling cost. Contract negotiations for the inter-office data network included backup fail-over lines for a competitive price. Using an on-demand based private Cloud Server infrastructure for FRP’s core business applications and servers, meant that a very high level of resilience was already built into Cloud Data’s server Docklands operations and no capital investment was required by FRP. The Private Cloud’s inherent resilience means that every one of FRP’s servers is snapshot every five minutes during the day. Those snapshots are automatically moved to a separate physical location and are available to be restored within five minutes after a major event. This also means that FRP are able to go back in time on the virtual infrastructure to resolve problems or major deletions and corruptions of servers. The five minute images are stored for 24 hours and then three snapshots from the previous day are kept - 7am, noon and 7pm – for a week. Beyond that, the snapshots are kept weekly and then monthly should FRP need to recover to a longer historical date. The snapshots of entire servers require an enormous amount of storage, which is included in FRP’s monthly hosting costs from its Cloud service provider. Mark Iwaszko added: “Exponential-e said they would guarantee delivery which was critical for FRP’s MBO to be a success. The challenge was immense due to the timeframe and I had the needs of nine offices and over 200 staff to consider, and failure was not an option. The network is a key component for FRP’s communication and we needed the right provider to deliver a network that was revolutionary. The tender process was swift and Exponential-e demonstrated they wanted to partner with us and not just sell us a solution. The offering was technically and commercially compelling but seemed too good to be true." "The project team was excellent from sign-off to delivery. I have been involved with IT and telecoms for longer than I care to remember and for telecoms standards this project had to be delivered in a ridiculously short space of time. FRP had to be very demanding and the team at Exponential-e were true to their word - they delivered a cutting-edge platform. Our model of a fully hosted private Cloud has worked extremely well for us. We are fairly revolutionary in putting all our information on a private Cloud and using new technologies to aid our business. We have signed a long-term contract with Exponential-e and they have proved to be an excellent partner. Exponential-e offered a platform that was technically and financially compelling and understood the need for a swift deployment. They were the only company that guaranteed to meet the deadlines and their technology was cutting-edge."